In Zurich we have an annual event called “Whisky-Schiff”. This is an entertaining happening where six boats dock im Zurich and many Whisky brands have their range available for tasting. Obviously The Whisky Agents had to be part of this. Where else can you try such a variety of rare bottlings at a reasonable price. Mind you, the place was totally overrun by all kinds of folk, but we couldn’t care less. 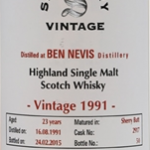 After sipping some rather average drams we came across a bottle of 22 year old Ben Nevis by the Italian bottler Silverseal (I had heard good things about them). My fellow Whisky Agent Tobi and I decided to give it a try since we quite liked the promise of the standard 10 year old. To not give away everything just yet let’s just say it was a different story all together. There was three Frenchmen next to us who bought the last two bottles as we where getting mentally prepared to do the same. Bummer…Well, Whisky Agents don’t just give up and we found the desired “juice” a couple of days later, much to our satisfaction. 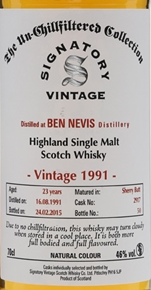 So the first ever tasting on this blog will cover three different bottlings of Ben Nevis. On the nose I get a little Sherry first, something floral(maybe camomille) followed by a martime breeze with a hint of seaweed. There is also a slight citrus note that reminds me of Bitter Lemon. Some apricots appear after 10 minutes and the nose seems to be more balanced. With water; more citrus possibly bergamotte, fresher and fruitier. Taste: Sherry again, a little oak, well composed but far from complex, a little light which would improve with higher ABV I’m sure. There is a hint of musty warehouse, which I enjoy a lot, medium finnish getting dryer. First nose: A raspberry patch by the sea ?!? Some grapefruit and tinned pears, sounds like a fruit basket to me. It’s quite light, must be some 3rd or 4th fill here. Too bad really. Can’t get much more out of this. The taste is a tad more talkative than the nose, some sweetness with a hint of oak. Really flat and not much to catch my interest. With some water we now have a fruit candy with a whiff of something sour, maybe lime. Tastes similar, less oak less expression. I prefer the 10.